Drop in and have a go on the potter’s wheel! Find hidden creativity in yourself. 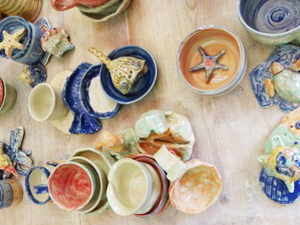 Enjoy clay and its many forms. Every Tuesday & Friday from 10.00 am until 12.00 noon. 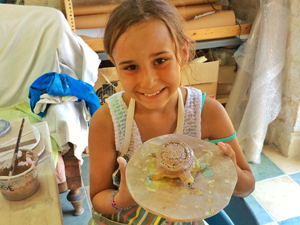 Try your hand at making two clay pots and your own small funny turtle sculpture. 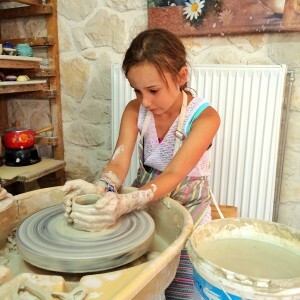 You, alone or with your children and friends, can have a positive experience creating your own souvenir. Paint it and take it home in a box or leave it with us. Pick it up after a few days fired and glazed or we will send it home to you by post. Enjoy two creative hours playing with clay. 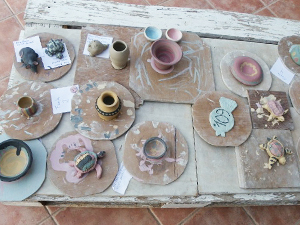 Price for lesson and first firing: 20 € per person. Price for glazing: 18 € 3 pieces. Approx. Europe postage costs: 20 € per kg.